The State of Washington’s Kids 2018 series looks at how kids of color are leading our state into a more racially diverse future. Through this series of data profiles and research briefs, KIDS COUNT in Washington seeks to address the fact that too many kids have never been well served by old structures that disproportionately channeled opportunity, education and prosperity along lines of race. For this series, the KIDS COUNT in Washington team asked local leaders: What would it take for Washington to be the best state for kids? How do we make sure young kids have a healthy start and have the opportunity to succeed in school and in life? We lift up their stories as well as key data and recommendations that demonstrate the ways policymakers, parents and community leaders must work to build a healthy future for all. Download “Kids are Leading the Way Toward a New Washington,” a racial demographic profile of Washington’s kids, “Getting All Kids Off to a Healthy Start,” the first issue brief in the series, and “Ensuring All Kids Have Opportunities to Succeed,” the second. We hope that, as you read the State of Washington’s Kids 2018, you’ll consider how to champion the solutions that fuel our common future. 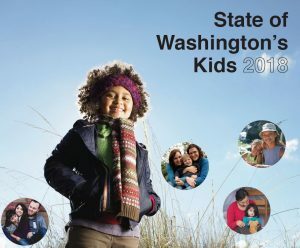 The State of Washington’s Children 2018 is available in a printed folder format. For a hard copy, please contact adam@childrensalliance.org.